The oil palm (abe) has thirty (ie many or uncountable) uses. You can not taboo the oil palm; you will always touch it. Tappers usually sell their sap to a women who is in business. 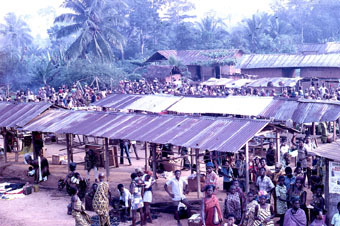 Trading (doing business) is seen as women's work, so hunters, fishers and tappers who want to sell their produce usually do so to one designated woman, who then does the marketing. 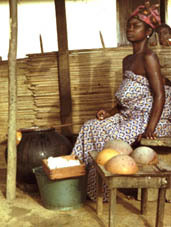 Palm wine sellers are usually women. This women buys her palm wine from various tappers. She also adds water to her wine, so one must be careful to avoid the parasites which are often found in water. She has a set of calabash drinking bowls of various sizes. As they dry they turn from green to brown. 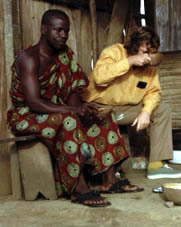 Drinking Palm Wine Early in the Morning. The Obo Kontihene, Nana Noah Adofo II, and I bought the large calabash of palm wine you see on the ground between him and the marketer. It cost about the equivalent of forty cents Canadian. It filled about eight small calabashes which we drank. The walls of this palm wine kiosk are made from mats made of palm branches. The palm wine continues to ferment through the whole day, so it is sour by afternoon, and not possible to save for the following day. It is always best drank in the morning. Occupational Benefit for Your Author. Look carefully at the small stain on the ground between the Kontihene's sandals. Before we drink, we always remember the gods and ancestors by pouring a small libation. This is not as long and formal as it would be in a chief's court, and can consist of even one word. A few drops on the ground is polite. It would be very rude to pour any large quantity to the gods and ancestors. 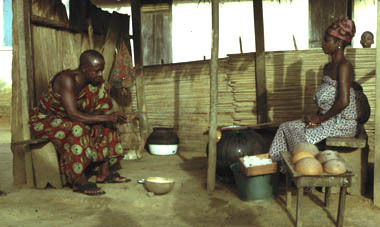 As an elder, and the head of his matrilineage, the Kontihene is sacred. He is possessed by his matrilineal ancestors, who are always considered part of the living lineage and community. For that reason, he must wear the large black sandals which separate black sacred (ancestors) from red sacred (Mother Earth). You have seen the calabash used for drinking palm wine. It is made from the fruit of a calabash tree (Crescentia cujete, native of Mexico and the Caribbean). Other calabash fruit are gourds related to cucumbers and watermellon, and which grow on vines. 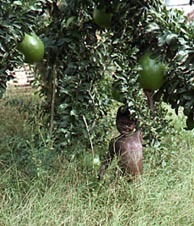 When the calabash fruit is on the tree, it is very soft and easily cut. The inedible pulp is taken from the inside and thrown away. 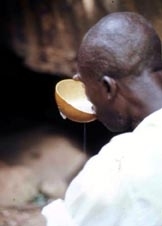 A drinking bowl is made by cutting it in half. If holes are put in its bottom, the bowl becomes a sieve. A bottle or rattle is made by hollowing out the whole fruit while leaving a narrow hole at the top. The skin of the fruit, about a centimetre thick, is soft and easily carved when fresh. It is used to make stamps, for example, such as the adinkra. A calabash is usually left blank, but some artistically minded people will decorate a few by carving designs on the outside when they are still soft. Oyo in Nigeria is famous for carved calabash fruit. 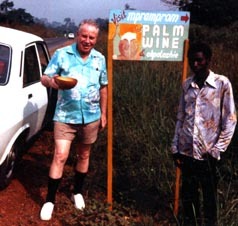 Although I have a few slides of markets, I do not have one specifically of palm oil sellers. Once, in a remote area where there were no automotive service stations, my motorcycle needed oil. I was easily able to buy some palm oil in a local market, and it worked well, although the engine smelled a lot like supper. The abe has thirty (many, uncountable) uses.